ERM is a powerful instrument for directing the entity towards the best options for managing its protection goals. 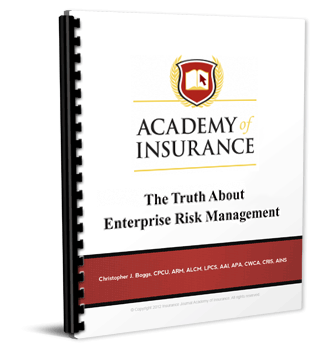 But even the power of a properly developed and managed enterprise risk management program is limited. The truth of enterprise risk management is that there may be too many limitations to make it a fully viable possibility. "ERM is a very interesting notion. I think an organization needs to engage in just the ‘right' amount of ERM and then let it go. I agree that it's plausible theoretically, but I think organizations can become too mired and bogged down when they attempt ‘too much' ERM analysis. At some point I think you reach a point of diminishing return where the more you try to avoid risk the more you put the organization in peril. Risk is opportunity. If you try to control too much of it, then what's the point. If it wasn't risky then everyone would be doing it." - Mitch Dunford, CEO, Wells Media Group, Inc.
Enterprise risk management (ERM) is an entity's use of finite resources (money, time, and talent) to accomplish business goals (progress goals) while simultaneously protecting the entity from unmanageable or unrecoverable financial harm (protection needs). ERM focuses on controlling the cost of risk associated with owning any type of property and conducting business operations. Additionally, ERM addresses every action, inaction, decision, or indecision made by an entity. ERM creates a powerful framework for consistent, repeatable assessment to point towards the best options and away from the least favorable options toward the entity's pursuit of its progress goals. Likewise, ERM is a powerful instrument for directing the entity towards the best options for managing its protection goals. But even the power of a properly developed and managed enterprise risk management program is limited. The truth of enterprise risk management is that there may be too many limitations to make it a fully viable possibility. This book describes and details the ERM process with the aid of several examples and flow charts. It also breaks ERM into its component parts, protection and progress goals, and exposes the truth surrounding the true functionality of full ERM.